At the end of 2009, I had to shoot my mouth off and say that I had decided to face my fear of yeast. I even suggested to The Mistah that The Bread Bible would make a great Christmas gift and sure enough, there was a copy of it under our tree. And as I sit here typing, that book hasn’t been opened. Not even once. Come on, it’s a little overwhelming to take on a project that involves reading a Bible, I don’t care what kind it is. Bibles are serious stuff, not to be taken lightly, and I’m not yet ready to make the commitment that a Bible requires. Maybe if we all took our Bible study a little more seriously, even our Bread Bible study, the world would be a different place. For one, maybe we would be enjoying more homemade popovers, rolls, and english muffins. And who wouldn’t want to live in a world like that? But I do feel like it’s time to put up or shut up on the topic of yeast. So thanks to Beth at 990 Square’s cinnamon roll post, I have at last, willingly dipped my toes in the splash pool. True to form, the yeast tried to get the better of me. Either my milk was too hot or my yeast was too old (or too ornery) because I didn’t get much of a first rise even though I let it sit in a warm, cozy spot for almost two hours. Disappointed, but not defeated, I kept going, adding the rest of the ingredients and crossing my fingers that I would be rewarded in the morning with a decent second rise. The next morning it became clear that I hadn’t managed to kill all the yeast since it had risen a wee bit overnight in the fridge. So the only thing left to do was melt some butter, mix up some cinnamon and sugar, flour the counter and get rolling. Oh, have I mentioned that I forgot to print out the recipe and so I was consulting Beth’s post via cell phone during all this foolishness? So Beth, that should explain any spike in your stats where it looked like someone was on that page for hours and hours….because somebody was. And let me tell y’all, flour and butter do not mix well with smart phones. You know what else doesn’t like to be handled with floury buttered hands? Cameras and lenses, but that’s another post. So I rolled and buttered and cinnamon sugared. I sliced and placed and baked. And I hoped. In the end, I’m saying this one was a tie. I didn’t get the rise that I should have out of the dough but I still managed to produce a cinnamon roll that I was proud of. In the oven, the rolls did their magic, puffing up and spreading until they were shoulder to shoulder with each other in the pan. For the most part, my seam held and all that buttery cinnamon sugary goodness stayed inside the rolls making a lovely spiral. I may have gone a little heavy on the glaze but I’m even ok with that. And I learned that without other distractions, I will compulsively eat these rolls until they are gone. I nibbled on one out of the oven for quality control. Then I served them as dessert after a quick reheat in a low oven. And then there was another one as a late night snack. The next day, I had one for breakfast and then another as an afternoon snack. Thank god we only have two left. The rest have either been eaten or given away. Sharing, that’s something you’d read about in a Bible. So maybe I’m not totally ignoring my Bread Bible study after all. BAH Note: Beth scaled down Ree’s original recipe. She did the work so you don’t have to. So maybe you could mosey on over to 990 Square and give Beth a big thanks for doing the heavy lifting. Because I don’t know a single person who needs seven pans of these things. And because I didn’t have the space in my refrigerator for the pot I used to heat the liquid, I transferred the warm liquid to a largish bowl (actually it was the bowl of my salad spinner…remember, we don’t judge here at BAH) before continuing on. In a different life, in a different kitchen, with a different refrigerator, or if I could have baked the rolls off right away, I would have kept everything in the original pot. Leftover rolls (as if) can be enjoyed at room temperature or gently warmed in a low (250-275 degree oven). I did ask Beth whether she thought the unbaked rolls could be frozen and baked off later and she said that Pioneer Woman “actually recommends baking and icing them, then freezing the whole thing. Frozen rolls should be reheated in the pan at 250. We’ve had luck freezing single rolls in ziplocs, then bringing them back to life in the toaster/convection oven.” So, you have some options other than binging on these till they’re gone. Mix 2 cups of milk, vegetable oil, and sugar in a large pot or dutch oven. Heat the mixture to just before a boil (I’m guestimating that’s about 200 degrees if you’re using a thermometer). Remove from the heat and let it cool for about 20 minutes. You want it to still be warm but not hot. Sprinkle the yeast over the warm liquid and let it sit for a minute or two. Then add 4 cups of all-purpose flour and stir the mixture together. Cover and let rise (in a warm spot) for at least one hour. After rising for at least an hour, add the remaining 1/2 cup of flour, the baking powder, baking soda and salt. Stir to combine. You can cover and refrigerate the dough for up to three days or move right into making the rolls at this point. If using the dough later, check on it from time to time to make sure it isn’t trying to escape from your bowl. Any dough trying to make a break for it can be punched down. When ready to bake, heat your oven to 325 degrees, combine the sugar and cinnamon in a small bowl and set aside, and generously cover a rolling surface and rolling pin with flour. Don’t skimp on the flour here because otherwise this dough will stick. Turn your dough out onto the floured surface, gently press out into a rectangular shape with your hands (give them a little flour too), and roll. Check for sticking dough and sprinkle additional flour on your surface as necessary. Once your dough has been rolled thin into a big rectangle, drizzle half of the melted butter onto the dough, reserving the rest of the melted butter for the frosting. I used a pastry brush to make sure it was evenly spread on the dough. Evenly coat the buttered dough with the cinnamon sugar mixture. Starting at the long side farthest away from you, roll the dough toward you, keeping the roll as tight as you can. Pinch the long seam together to seal it when you reach the end. Cut the roll into 1 inch thick slices. Butter two 9 inch cake pans or pie plates. Place the rolls into the pans leaving space between them so they spread. 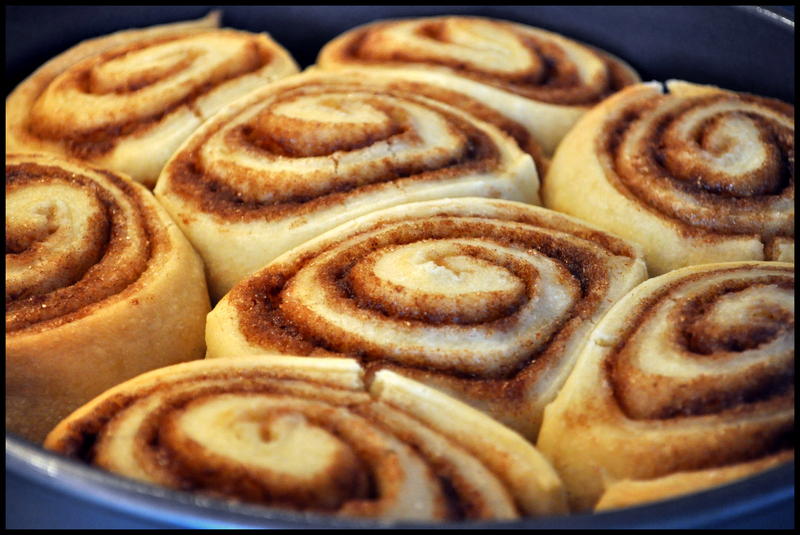 Bake for 20 to 25 minutes until the rolls are browned, then place the pans on a cooling rack while you make the frosting. Combine the powdered sugar, maple syrup, remaining 1/4 cup milk, coffee, and the other half of the melted butter in a large bowl and stir until thick and smooth. Taste and adjust flavors as desired. Pour the frosting over the rolls and enjoy. Thanks for the love Wendi! I think your yeast must have been old. I barely cooled my milk at all and I didn’t have any yeast killing. I go through a lot of yeast at the Ratskellar (that’s what bread making twice a week will do to you!) so mine was pretty new. Time to teach the Mistah how to use the camera, even if it’s just on auto. Noel is always pulled into picture duty when I’m doing something really messy, like rolling cinnamon rolls! Beth, I like your old yeast theory. In fact, I was surprised that the expiration date was March 2010 and I had only just bought the yeast two weeks ago. Yes, I blame the yeast completely. I wonder if I could bribe The Mistah into manning the camera with the promise of tasty treats? It’s got its own tripod and everything now. Tracy, my waistline can’t afford for me to do this again…I seriously binged on these things because I have no willpower. Of course, if some other local bloggy folks would like to help me eat tasty cinnamon rolls, then I’m sure we could work something out. Did you buy packets or a jar? My jars usually have an expiration date a year into the future. I only had a packet when I made this because some were given to me. We should do a blogger brunch. I really want to experiment with turning this recipe into orange rolls. yum. I buy the packets because I use yeast so infrequently. Blogger brunch…hells yes. I’m bummed that I won’t be at the get together next weekend. I had planned to bring those Berger cookies. I wonder what would happen if you put a wee bit of marmalade or preserves into the filling? In my opinion, you totally won. You didn’t bake rolls that could have substituted for hockey pucks. WIN! I totally freaked out when The Mistah threw my very last roll in the microwave to warm it up. I was convinced that it would, in fact, come out like a hockey puck. Surprisingly, it didn’t. Congrats on facing yeast!! I keep the packets too in my fridge. Just about the only thing I use them for is pizza dough! this looks divine! Shan=me I think of yeast as something in a bad Japanese horror movie…..ya know where the words don’t match the mouth….as t he yeast monster sublimates all before it! My kitchen has definitely seen its share of yeast monsters. And I imagine there will be more to come!